Participants are encouraged to dress in their Halloween costume for the Scary Scurry and bring a food donation to help stock the shelves at the Vail Valley Salvation Army Food Pantry. 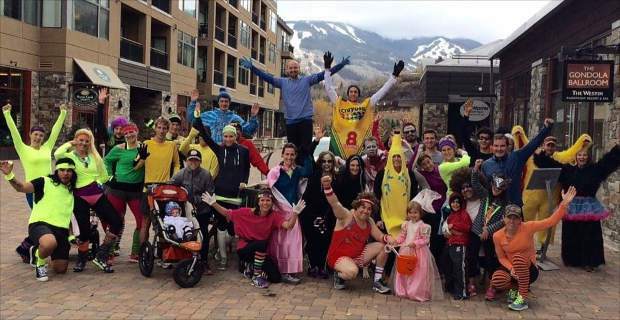 AVON — The Westin Riverfront Resort & Spa at Beaver Creek Mountain is kicking off the Halloween weekend with the second annual Scary Scurry Costume 5K on Friday at noon. Free and open to the public, this 5K walk/run will leave from The Westin Riverfront’s Gondola Plaza. The Westin’s run concierge Tamara Donelson and assistant athletic club director Heather Pugh will lead participants on the course, which will go west on the Eagle River bike path, around Nottingham Lake and then back along the bike path to end at The Westin. Participants are encouraged to dress in their Halloween costume and bring a food donation to help stock the shelves at the Vail Valley Salvation Army Food Pantry. Runners and spectators can tag Scary Scurry photos on Instagram with #ACWfit. The Westin Riverfront is encouraging all of its associates to participate in the 5K as part of its Mountains of Wellness initiative. Mountains of Wellness is a comprehensive support program that includes quarterly wellness trainings with a certified health coach, weekly nutritional tips and healthy recipes and quarterly Wellness Challenges. Dust off your fairy wings, masked superhero or ghastly ghoul costume this Halloween for two additional events at The Westin, taking place at Maya restaurant: the Mad As A Hatter Brunch and the Day of the Dead Celebration. Held from 7 a.m. to 2 p.m. Sunday, Maya’s Mad as a Hatter Brunch will feature a full brunch buffet with a build-your-own omelet station, tea party pastries, sandwiches and more. Tea service will be available upon request. Maya will also be serving its full breakfast menu, with lunch items available after 11 a.m. Enhance brunch with a cocktail, including a Cheshire Cat Bottomless Mimosa, $12; Mad Hatter Madhatten, $9; or Alice’s Gingerly Fiz, $9. Come in costume for a 10 percent discount; costumed kids younger than 12 get half off their breakfast. Maya’s Mad as a Hatter Brunch is $27 for adults and $12 for children ages 5 to 12. Reservations are highly recommended; call 970-790-5500 to save your spot. Maya is also hosting a Day of the Dead Celebration on Monday, Oct. 31, from 9:30 p.m. to 12:30 a.m. There’s no cover charge, and the evening will feature a costume contest, door prizes and a drawing for a bottle of Maya’s Casa Herradura Tequila and tequila locker storage for a year. Visitors can sip Halloween cocktails and take advantage of a limited happy hour menu while dancing the night away to JV3, a ’90s pop-rock cover trio from Denver. The Westin Riverfront offers complimentary on-site valet parking for Maya diners and bar patrons, based on availability. For more information on Maya, visit http://www.richardsandoval.com/mayabc.